Join the battle on Spartacus Gladiator of Rome Slots! Play on its Colossal Reels and watch as Wilds appear as Stacked on the reels to award huge wins! 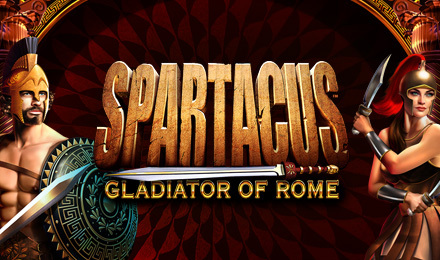 Spartacus Gladiator of Rome is a fantastic ancient Roman themed game that is powered by SG Interactive. Join Spartacus, the gladiator on the main reel set consisting of 5 reels and an impressive 100 paylines. There is also a Colossal reel set which is twelve row high. The symbols appear as stacked on the reels and the Spartacus Stacked Wild can transfer from the main reel to the Colossal Reel. Colosseum Scatters landing on the reels will activate the Free Spins Feature where you can earn up to 20 Free Spins plus 20x the total bet!